CORFLUTE AFRAME: The Coreflute Insert A-Frame, features a powdered black frame with a swivel top flap, that keeps the insert in place but also allows you to change it easily. At a finished size of 900 x 600mm, the inserts have a visible area of 890 x 590 mm, and are printed on 5mm White Coreflute with UV Laminate. Suitable for all outdoor uses, and weighing only 11kgs, they are easily transportable and the perfect outdoor advertising tool. 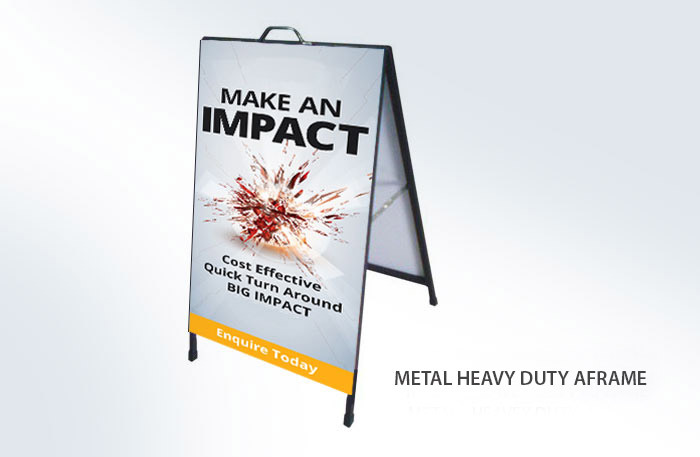 METAL AFRAME: Ideal for high foot traffic areas, the Metal Face A-Frame features a 900 x 600mm face, powdered black frame and cast iron handle. It has detachable metal sheet faces made of white colourbond, which is then coated in a UV resistant laminate, making it a very sturdy advertising product for all environments.